That’s a comment from around the time of Trans Day of Remembrance last year. …because all trans organizations are so flush with money (yes, there’s that fake trans organization that HRC owns and that, like all Gay, Inc. entities, hires lesser-qualified non-trans people over better-qualified trans people, but lets ignore it for the moment – and preferably forever) that the memory of trans people (and some non-trans people who were presumed to be) who died via violence can be used to fund an issue that, however worthy it may be of funding, is not connected to the issue of violence against trans people. I suggest writing this organization a check for zero dollars and zero cents and – tastefully, non-harassingly, without any threat or implication of violence and, most importantly in light of the disrespect inherent in this expressing your feelings about this latest erasive appropriation, respectfully – expressing your feelings about it in the memo line. 26 year old Eyricka Morgan was fatally stabbed Tuesday night in a boarding house in New Brunswick, NJ. Once again a dead African-American transwoman has been misgendered in the media because Sue Epstein, the Star-Ledger reporter in question either failed to do her job or as I suspect, the New Brunswick Po-Po’s information officers misidentified and misgendered Ms. Morgan for whatever reason. Epstein is an exterminationist transphobe TERF. But if Sue Epstein gets to pick dead Eyricka Morgan’s name and gender, then we who live get to pick the reason that Epstein did it. HRC claiminmg that it gives a damn about dead trans people (after all, their own obscene history with respect to their own employment policies tell us what HRC really thinks about living trans people) is like Mitt Romney claiming to give a damn about all of the people whose careers he destroyed to extract money from the previously-profitable companies that they once worked for. 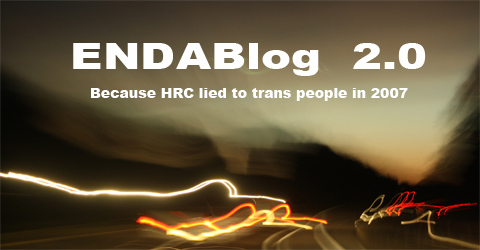 How many trans people are dead today because, in the 1990s, HRC – a moneygrubbing civil rights vortex that never bothered to even consider hiring a trans woman until it got caught in a lie that, even with Queer Channel Media in its pocket, it couldn’t get out of back in 2007 – legitimized the genocidal, fraudulent legislative strategy of ‘incremental progress’? You too can become a Boston TDOR sponsor. You can make MTPC’s TDOR page look like a sponsored NASCAR vehicle! Well, I can think of at least one distinction. I’d be far more likely to trust any high school baseball player than I ever would anyone or anything connected to the Rhode Island Avenue Cesspoool of Transphobia.